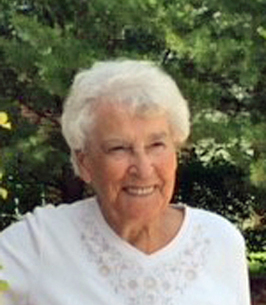 Jean Rogers Service Details - THUNDER BAY, Ontario | Sargent and Son Ltd.
ROGERS- Mrs. Jean Ethel Rogers, age 87 years, passed away peacefully on Sunday, August 5, 2018 at Roseview Manor. She was born in Port Arthur on October 16, 1930, one of four daughters of Tom and Ethel Melluish, and grew up in Current River. Jean met Bill Rogers and the two were married and together raised 4 children. An athletic woman, she enjoyed golfing and curling as well as bridge club with her sisters and friends and playing cribbage with Bill. Jean was a longtime member of Current River United Church and was a respected bookkeeper, working for many years with Northern Wood Preservers. Jean enjoyed her winter trips to Florida with Bill but her greatest joy came from time spent with her family, especially her grandchildren and great grandchildren, during their summertime visits to the family pool. She will be lovingly remembered and dearly missed by her children: Gary Rogers, Chris (Doug) Irwin, Billy (Christine) Rogers and Debbie (James) Coady; grandchildren: Scott (Sharlene) Irwin, Kirsten (Dennis) Pradal, Kim (Eric) Ekholm, Kyle Rogers, Matthew (Lauren Irwin) Coady, Eric Rogers, Alyssa Coady and Abby Rogers; great grandchildren: Logan and Leila Irwin, Alex and Cameron Ekholm and Lily and Eli Pradal; sister Aileen Lalonde, sisters-in-law Helen Rogers and Marion (Jim) Payetta as well as by numerous nieces, nephews and other relatives. She was predeceased by her husband Bill and sisters Chris (Joe) Fero, and Mabel (Elmer) McDonald. A service to celebrate Jean’s life will be held on Friday, August 10, 2018 at 1:00 p.m. in the Sargent & Son Funeral Chapel, 21 N. Court Street with Rev. Joyce Fergus-Moore presiding. As expressions of sympathy memorials to the Alzheimer Society or the charity of your choice would be appreciated. On-line condolences may be made at www.sargentandson.com. To send flowers to the family of Jean Ethel Rogers (Melluish), please visit our Heartfelt Sympathies Store. SUCH A FUN GAL. SURE MISSED HER WHEN SHE STOPPED CURLING. Our condolence to Gary Rogers, Chris & Doug Irwin, Debbie & James Coady and their families in the loss of their Mom, mother-in-law, grandmother.